My Ride or Die Summer Essentials + Giveaway with JORD Watches! Can you believe it’s already July?! My favorite month of the year aka my birthday month… Let the celebrations commence! Speaking of my birthday, I recently treated myself to some new summer essentials that I’m dying to share! Most of them are on such a good sale right now that you can’t miss it! 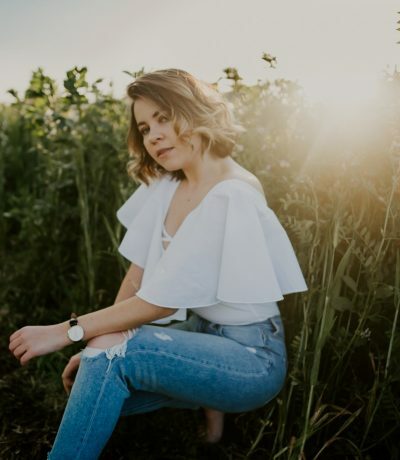 I also partnered up with JORD Watches once again (see my previous collab here), and am sharing details for an awesome GIVEAWAY at the end of this post, so please keep reading! First, I’d like to talk about these two summer essentials. The satin top is my recent score from H&M, and it was such a random find at an amazing price! I was actually about to leave the store empty handed when I took one more turn and ended up at the sale aisle. This satin beauty was only $5! I will admit, I already have two similar satin tops in different colors, but I could not pass this one. I fell in love with the silver/ metallic? color and I knew it will go perfectly with my new watch from JORD. If you read this post, you know I’ve been looking for a new, affordable (faux) leather jacket. I said it once and I’ll say it again, H&M never disappoints in this department! I bought my first biker jacket from them about 5 years ago and worn it a bunch since then. So much that it was time for an upgrade! I had my eyes on this jacket for a few months now, but I’m so glad I waited. A few days ago I randomly came across it again and I managed to score it for just $25! I seriously could not blog about it soon enough to make sure you can get your hands on it too! I love it so far and already got so many compliments! I’m wearing a size 2 for a reference. If I could I would have gotten a size 4 as usual, but that was the only size available at the time. Still happy with it though! I love my jackets to be nicely fitted anyway. If you’re into fashion, I bet you’ve been seeing the wedge espadrille takeover lately! I am guilty of wanting to buy them as soon as I saw some of my favorite bloggers wearing them. So happy I finally snatched them! I was particularly looking for a cheaper version of the famous Chloe ones, and I gotta say Steve Madden once again didn’t disappoint! At first, I was a bit hesitant to buy them because of the icky reviews online. However, I decided to skip this online purchase and check the shoes out in store. Needless to say, I fell in love right away! They’re very lightweight, fit perfectly and didn’t seem to put pressure on any part of my feet. I worn the shoes later that night for a housewarming party and I managed to stay in them all night without any blisters. I think for the first wear that’s pretty good! Another great buy that I highly recommend. Now, I’m excited to share the details for the GIVEAWAY! 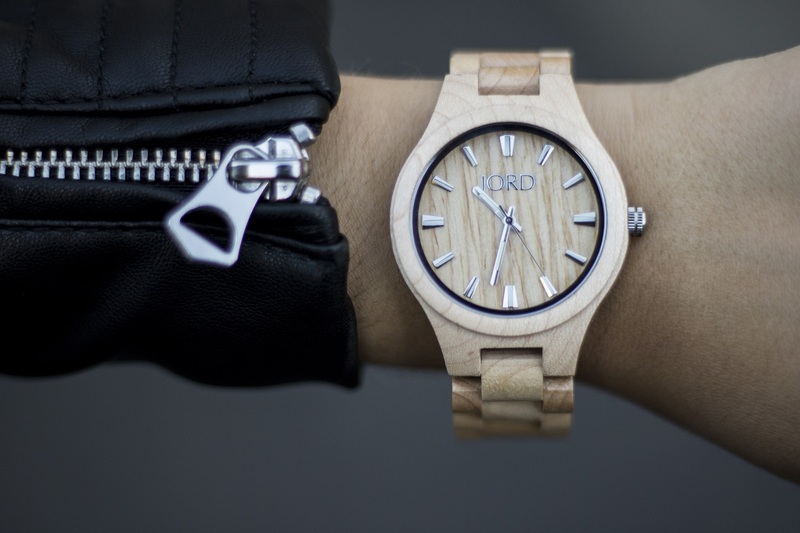 I partnered up with JORD watches to give you a chance to win a $100 gift card to use on the JORD site. One lucky person will win, but everyone who enters will receive a code worth $25 once the contest ends! TO ENTER, click HERE and fill out the short form. The giveaway will close 07/09/2017 at 11:59pm. Both the $100 and the $25 codes will expire on 09/30/2017. Thank you JORD Watches for sponsoring this post! OMG I have been looking for satin top all this while but somehow I never checked at H&M… ahhh gotta rush now! Love the outfit you’ve created, brings so much persona! That leather jacket was definitely a steal deal! Their watches are amazing especially the one on you! I love the contrast of the simple watch with the edgy outfit! I love JORD!! I have the exact same watch as yours and I literally wear it all the time. This is such a gorgeous watch and goes with any outfit! This outfit is everything!!! You rock it girl! !